Alex Segura has had an interesting career inside and outside of comics. He’s currently the Co-President of Archie Comics; he wrote or co-wrote a few issues of Archie, including Archie Meets KISS and The Archies, but much of his writing has been outside of comics. He’s written four novels featuring reporter-turned-private-investigator Pete Fernandez. He also co-wrote the podcast Lethal Lit, which was released last year. Segura has edited many comics over the years, but he took over editing the flagship title Archie with issue #700, when Nick Spencer took over writing the book. Segura and I have known each other professionally for years, but we’ve never sat down and conducted an interview. With his new editorial job and a new novel, Miami Midnight, coming out in August, it was an opportunity to talk with Segura about the many hats he wears, approaching character and plot, and his editorial philosophy. Alex Dueben: You’ve been editing for years now, but you recently took over editing Archie with the new numbering as Nick Spencer took over writing. What was behind decision to relaunch the book in this way? Alex Segura: The idea was that Mark [Waid] had had such an epic, iconic run that reintroduced Archie and his friends for a more modern audience – and it worked so well. 32 issues is a pretty amazing run these days. We knew we wanted to stay in that framework that Mark had laid out. We didn’t want to deviate too much from it, but we wanted a different flavor and to have an element of noir and darkness while still retaining the general humor and characterization and friendship that had really made the book a success. I knew Nick Spencer based on his own work and I knew he was an Archie fan. To me, the perfect person to write Archie is someone who has a background with Archie but is also talented. We obviously want someone who’s talented, but familiarity with the characters is really important. It feels stronger and purer, I guess, if there’s a sense of character. You can put Archie in different situations – you can have the Predator chase him, you can have him meeting KISS, you can have him interacting with Batman, but if Archie isn’t Archie, it feels forced. It feels like a gag. Mark did such a great job boiling it down. That first scene where Archie is opening his locker and saying, this is my life, that feels like Archie. I needed someone that was familiar with the characters but was also going to come to the table and change things up in a way that didn’t feel like a seismic change but would feel a little different. That would evoke the [Riverdale] show but didn’t feel like an episode of the show. Dueben: It feels like Nick’s run so far is taking cues from the TV show but also operating and moving in different directions. Segura: That was intentional. If it feels too much like the show, it’s the Riverdale comic or it should just be an episode of the show. I think that’s something comics has trouble with. I’m not saying we’re doing it perfectly right, but sometimes you’ll see the source material start to veer towards different iterations to pull in that audience. Just because there’s a TV show based on this superhero with a supporting character that isn’t in the comics, doesn’t mean you have to introduce that character in the comics. We wanted to evoke the show and the things that make the show work — the mystery, the drama — but also retain what kept the comic popular and what kept people reading it. I think it would have been very easy to say, this is a new #1 and this is a new jumping on point but I felt we could do that with #700. That was something we debated internally a lot and our CEO Jon Goldwater said, “let’s embrace history.” It tells fans that this is important and that everything that came before matters. Dueben: One way it helps to differentiate is Marguerite Sauvage’s art and coloring, which really help establish a different tone from the show and help to make the comic its own thing. Segura: Marguerite has done a fantastic job for us on the covers for so long. I really wanted to work with her on interiors for some time and it just seemed to sync up perfectly. She brings this beautiful line art and design sense and style. It’s very Archie. When she draws Betty and Veronica, you feel, that’s them. It evokes the relaunch in some ways. We had Mark come in and we knew the story would be great but in some ways it was Fiona’s visual look that recalibrated the whole thing. His story was pitch perfect and it worked really well, but you needed that modern look. You needed Fiona to come in and re-imagine the visuals. If it had been drawn in a more classic way it would have felt like a different story. I think Marguerite had the same effect on Nick’s story. It made it feel different and special. I regret that she couldn’t be on the book for longer. We were really lucky to have Sandy Jarrell who we’d had in the queue as the next artist and he’s really evoking her art in some ways but it’s also him. He’s not trying to draw like somebody else. He’s doing a great job. I think it’s his best work. Interior page from Archie #703. Writer: Nick Spencer, Artist: Sandy Jarrell, Colorist: Matt Herms, Letterer: Jack Morelli. Dueben: And Marguerite stands out after Audrey’s great run on the book as artist. There’s been this conversation about Archie having a “house style” despite having some very different artists. Segura: If you have any knowledge of the art — even “classic Archie,” which is such a broad term — Samm Schwartz’s art doesn’t look a lot like Dan DeCarlo’s art doesn’t look a lot like Harry Lucey’s art. They’re all working on an algorithm, but even Bob Montana, who started drawing the characters a certain way at a certain point, started drawing them like DeCarlo drew them. [“Classic Archie” is] a very broad term. Audrey did a fantastic job. She was such a find. Archie has often been stumbling across these artists like Audrey, who started on Josie and just knocked it out of the park before working on Archie, or Veronica Fish, who’s drawing Sabrina. Marguerite has done work for pretty much everyone so I can’t lay any claim to discovering her, but she’s fantastic. Dueben: When you were taking over editing the book and talking to Nick, was the plan from the outset to tell a serialized story? Because this isn’t something that Archie had done in this way before the relaunch. Segura: Right. A big difference between Archie and mainstream comics for decades was that Archie was much more of a sitcom approach as opposed to the dramatic saga going back decades. With the Mark and Fiona run, that changed, and it changed the line. Stuff like Afterlife with Archie had an ongoing narrative. We’ll continue with that and Nick has a great handle on the characters and we have a few surprises up our sleeves, too, which will be fun. Nick’s second arc on the book is going to be retitled Archie and Sabrina because the big plot reveal from the first few issues is that Archie has been in this secret relationship with Sabrina Spellman and so it made sense to re-title the book for that arc. That lets people know, this is going to be the focus of this story. That will give readers a chance to know when to hop in and what the theme will be for the next arc. Dueben: Having read your novels, you seem very concerned with structure and plotting. There are lots of crime novels and comics that do both poorly, but we love them anyway. But I feel like this carries over into your editing, and is important at Archie now. Segura: I hate think about it in financial terms, but it is about the value of your dollar. When you bought a digest 15 years ago — or when I bought them as a kid — I was getting a lot of stories for very little of my parents’ money. I put down a couple bucks and got 200 pages of comics. The quality and the quantity was there. Today, people are paying 4-5 bucks for a comic book and it’s 20 pages and it has to be significant. The challenge is that we’ve decompressed the storytelling so much. As an industry, there was that moment when people realized, I can just write to the trade and I think that novelty or that cushion has worn off. The window for success is much shorter. You have to grab people right away because you need to survive in one market before you can get to the next one, if that makes sense. I feel like each issue needs to be impactful. I think about that in terms of the novels, too. People are paying $25 for a hardcover or $10 bucks for an ebook and you have to entertain — unless the goal is something else, but for me, it’s about entertainment. I want people to be surprised by the ending. I want people to feel like the characters have evolved enough to merit their engagement. It doesn’t have to be fan service; you don’t have to just give them what they want. The saying is that you give them what they need or what they don’t know that they want. You have to entertain them. You have to get a reaction. Editorially, that’s a challenge. I teach this class on Litreactor about comic book pitching, where I help students form their ideas into a pitch. Some have become comics, which is gratifying in many ways. One of the big things that I always tell them is that you have to know how to pace the story. You can’t just say, this happens and then that happens. You have to show the editor that you can break it down by issue, and have a beginning and middle and end and spread out your twists. You can’t just info-dump the story. I think that plays into any form of entertainment. You have to plan it. A lot of that can come on the front end or it can come in revision, but it’s going to come one way or the other. Or it’s just not going to work. I think it’s much harder with novels because you want to keep yourself entertained. I think readers get that. They can tell when a surprise is planned or if it’s something you just threw in there because you don’t know what you’re doing or you’re desperate to get a reaction. Which is not what you want. Dueben: In each novel you’ve written, and in comics you’ve written as well, the story has an arc but so do the characters. Segura: With the novels people ask, how do you map your stories out? I think, what’s the story I want to write, independent of character? What do I want to write about thematically? What are the things I’m obsessing over? What do I want the character to do? Where do I want Pete be at the beginning and where do I want him to be at the end? 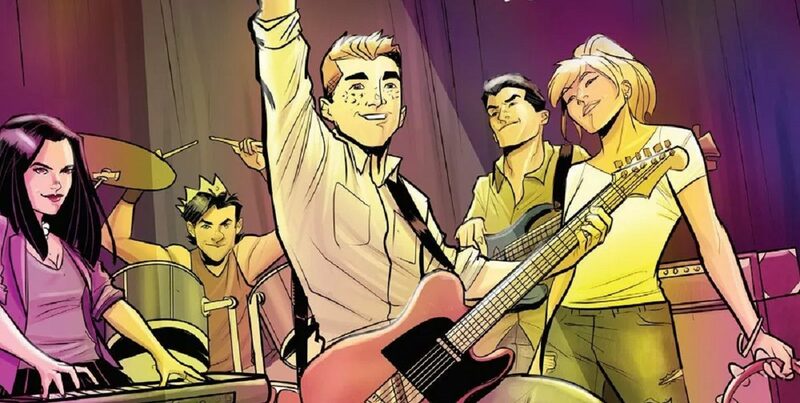 For something like The Archies, Matt Rosenberg and I really wanted to tell the story of a band. No frills. This is what happens when you go on tour; these are the issues you face. We knew that the book wasn’t going to run forever, we just didn’t know where it was going to end, so we always had the last issue in our back pocket. Once we knew the book was ending, we started planting the seeds for the final one. We knew that the band would break up and that the story was really about friendship. We had that character arc and how it weaves into the mechanics of the story. That sounds mundane, but it’s about the character and how it weaves into the plot. For me, it’s character first. Dueben: Writing Archie books, you’re dealing with characters who don’t change much so you have to find this emotional arc. Segura: The illusion of change, which was discussed a lot in the Bronze Age of comics. I’ve been rereading a lot of old Batman comics. I don’t know why; it’s just comfort. You have these long, epic runs by Len Wein, Gerry Conway, Doug Moench. They’re all writing the character for 20-30-odd issues and a lot “changes” but then it smoothly comes back into place. I think that’s what we have to do, especially with [intellectual property] that’s been around longer than we’ve been alive and probably will be around much longer after we’re gone. You have to write moments of change and drama and suspense, but also be able to able to recalibrate it down the line without being too dramatic about it. With The Archies book, there’s change and drama and suspense, but by the end, they’re back to where they were before. You could choose to ignore the story completely — and not to minimize the work we all put in — but it doesn’t the change the characters. Because you can’t. It’s not our place. We have to be caretakers of these characters and that’s how I see it when we’re working, especially on the mainline books. With a lot of the alternative takes like Afterlife or Jughead the Hunger, we have a lot more wiggle room. You can kill a character or you can alter the relationship dynamics, and that’s where the fun is, seeing the twists on the preconceived ideas of these characters. So you can have your cake and eat it, too. Dueben: I was going to say that Vixens takes these characters and their relationship but the story is very different. Segura: Vixens was such a fun book and I feel like it’s between the mainline Archie books and the alternative horror books. Conceivably, Vixens could have happened in “continuity,” although we don’t have a hard and fast continuity. But yeah there is that room to tweak things and alter things and take different approaches. It’s a test of how flexible the characters are, which is a lot of fun. Dueben: How do you compare that approach in Archie to mystery novel characters like Lew Archer or Poirot who don’t change much? Segura: I think it’s very similar. I think the intentions are different. In terms of a private eye or a crime novel protagonist, there are two paths. There’s the evergreen protagonist where it’s very plot driven, like an episode of Law and Order where it’s more about the case and less about these progressive plot twists that change the character. Then there’s the evolving character. I only use those terms because I teach a PI class and those are the two paths that I think the genre does. In modern PI, novels you’re either one or the other. I’ve yet to see a blended one. The challenge is that the evolving PI has a shelf life. You can only really pull your character through the situations so many times and change them so many times before someone says, “this is exhausting.” You don’t know what the plateau is. You’ll notice that in some series will start as an evolving PI and then hit this point where this is where the character is and this will be the status quo for four or five books and then start evolving much more slowly. Then you have the perennial PIs who are never changing. Lew Archer does not really change. Marlowe does not really change. You get inklings of what their history was but it’s never really affecting their day-to-day. It’s much more about evil and the psychology of the villain and things like that, which is interesting. There’s a lot of comfort in reading those kinds of books because you can burn through a lot of them. But for my own writing and my own interests, it’s about evolving and showing these characters changing and failing and becoming something else. Dueben: In that sense, those characters are more like Batman. It’s about the case and the villain and the story, but then ultimately, they end in the same place they started. Segura: In comics, I think there’s almost this resistance to erasing that. To saying that these characters are who they are and you can have this illusion of change. I feel like the audience sometimes wants change, but then they get mad when the change is permanent. Its almost this push and pull. You’ve got these reboots and these earth-shattering changes like character deaths or murdering supporting characters and then as a reader and as readers for decades, you start to see that these things are not permanent. There’s a kind of cognitive dissonance there. You should just let go. You want fans to accept that these things are fluid. And that’s okay. And that all these things can happen at the same time. Just accept the multiverse and accept these different iterations and there’s no definitive continuity — and that’s okay. It’s all a metafiction. That’s just the challenge we face putting these books out. Segura: I think people are open to the flexibility of the characters, as long as they feel true to how people think the characters are. It’s not just the dynamics of the romance, but how they behave. Jughead is Archie’s best friend. Betty and Veronica are sometimes competitive but they’re almost sister-like in their friendship. Archie is this everyman hero. With those elements, you can put them almost anywhere. You can do Jughead’s Time Police or make Veronica a vampire or make Betty a werewolf hunter. It feels like things are being pushed in different directions by degrees and the external stuff is changing, but the characters are the same. It also opens the door to a lot of possibilities in terms of stories, so you’re not just locked into the teen high school soap opera. I think the first time we saw the potential for that was with the wedding, where we jumped forward and you see Archie getting married and these two alternate timelines and that became Life with Archie, which was for many years the flagship in terms of pushing the story forward. Then Afterlife really kicked the doors down. Who would think that one of the leading horror publishers in comics would be Archie? I like to think it’s true. We put out consistently high-quality horror books and we have for some time. There’s instant familiarity with these characters and then you put them in these extreme settings that are done really well and that’s got a built-in audience. I think we’ll see a lot more of that. Dueben: Sabrina, I think, has been changed the most. The comic more than the TV show, which is really horrifying and well done. Segura: It’s terrifying, psychological horror. I think it can be more disturbing than Afterlife, which is saying a lot. Then you have the show, which pulls from that in great ways. It’s been really exciting to see that evolve and to know that fans are comfortable with different iterations of the character. That really terrifying horror version is there, but they’re fine with the teen, fun, comedic version. These things can coexist and there is no definitive version that trumps the rest. Dueben: One thing that Archie has done sporadically over the years is superheroes and you oversaw a revival few years ago. Segura: When I came back to Archie, we rebooted the heroes and it became Dark Circle and we published The Fox, The Black Hood, The Shield and The Hangman. It’s a tough market for superheroes. With the main superhero publishers increasing their output — some of the core titles like X-Men, Spider-Man, Batman are being published twice a month — I can’t fault the retailer for going with a known commodity over something unknown with a limited track record. I am really proud of those iterations. They did okay in the direct market and they’ve flourished in the book market because the stories are good. It’s a challenge. The benefit at Archie is that we have this stable of characters for such a long time dating back to the Golden Age. The challenge is, how do we put these out there in a new way and set them up for success? It made sense to focus on the stuff that was working like the horror books, the main Archie books, and let the heroes rest. It is a challenging market for a new series. Dueben: You have a new novel out this summer and in each of your novels you deal with multiple timelines. Pete’s journey is echoed through the trauma and confusion of when he was younger and how it plays out in the present. Are you continuing to reflect that sense of personal history and larger history reflected in the stories in this one as well? Segura: Definitely. I think in many ways, this fifth book is a concluding chapter of this first arc of his story. It’ll deal with a story that I wasn’t ready to tell about Pete until now. I realized after writing the first book that we don’t know about this part of the character’s life. It was just finding the right way to explore it. With this book, it felt like the right time. The story is basically, what happened to Pete’s mom? We never hear about his mom or know her story. We presume that she died when he was young and that’s it. Part of this new novel is his discovering that there’s more to her death than what he thought. That throws his entire worldview into disarray. His father — who Pete worships, who he thinks was this legendary detective — gave him the wrong information and that really shakes him to his core. That ties into a case he’s working on in the present day and this journey he’s been on to figure out what he wants to do. I feel like it’s been in front of his face but sometimes the things that your friends or your family tell you that you should do, you ignore until you have your own moment of discovery. That’s what this book is about. Pete finally figuring out what he wants to do now that he’s gotten past the initial chaos of addiction and recovery. So he needs to figure out how to continue and live with this. There’s more to it than that, obviously. Violence and conspiracy and gunplay. I’ve been listening to jazz, so there’s a lot of that in there. It’s been fun to write, but definitely the hardest to write. You start to feel attached to these characters and from one perspective, you realize that it’s time to put them away for a while. Part of you doesn’t want to. It was hard to say, “now I’m going to write this scene where this person dies,” or the scene where Pete discovers this thing that will change him forever. Nobody said it was easy. Dueben: Are you planning to write more Pete novels? Segura: I think, yes. Maybe down the road I’ll come back and see where he is. By the end of this book, he’ll be at a point where he’s achieved a new status quo. We’ll see him at full power as a private investigator which recalibrates things. I can see myself revisiting the series, but it probably wouldn’t be for a little while. I have a few ideas for stand-alones that I want to do where the stories don’t need to be five books long. I’ve got a few creator-owned comics that are in different stages of existence. I wrote a podcast last year that did really well and it was a new world and way of writing that was really fun. But I’m really thankful to the Pete books because writing five books in about five years is a crash course in plot and character. And forcing yourself to write instead of waiting for lightning to strike, which I think is a great lesson to learn. Dueben: As you said, you helped write a podcast series which came out last year. It was episodic, it was a mystery, but audio drama really is its own beast. Segura: Heather Einhorn and Adam Staffaroni, who run EEP — Einhorn’s Epic Productions — reached out to me. We’ve known each other a long time. They wanted to do a mystery YA podcast and we did a lot of brainstorming and brought in Monica and laid out the story. We had to break it down by episode and we had to be mindful of time. In comics, you can write less and let the art drive it, and in a podcast it’s the audio. The door creeping open, footsteps down the hall. All these things that you don’t think about when writing a comic. There was a lot of learning there in addition to trying to build a compelling mystery that felt meaningful and set up this world and these characters and was entertaining. It was interesting. I would do it again. It gives you a sense of what it’s like to work in Hollywood. With novels, you’re very isolated and you’re in your own head. By the time somebody else gets to it, you’ve created it and it exists so you’re going to get feedback but it’s much later in the game. With comics and podcasts, people are along for the ride. It’s collaborative and you have to be open to that. Working with Monica and Adam and Heather was fun. It was a good team effort and it’s very different from working on a novel, but I liked it. I’m always up for collaboration. I co-write comics a lot, which I think is fun. Working with Matt on The Archies, we both had very different styles and we were democratic with how we split up the script, but then we’d trade off and tweak each other’s work and it became greater than the sum of its parts. I’m always up for collaborating with someone who’s willing to step away from their ego and let go. You have to be okay with someone changing your words, which not everyone is. Dueben: Making creator-owned comics is somewhere in between writing novels and these very collaborative efforts. Segura: If you’re doing company-owned characters, there’s always someone who can say, Jughead won’t do that. You can’t inherently alter the character. Whereas in the novels, if I want Pete to do something, I am the arbiter of that. With creator-owned comics you can do that too, but you have to get the sign-off from your co-creators and the people in the trenches with you. You have to build a team and they have to all be invested. There’s more consensus building in creator-owned comics, or at least playing well with others, whereas with novel writing, the only people you need to sign off on it are your editor and agent, but at that point it’s your creation you’re changing. Dueben: From our conversation and listening to how you’re talking, it sounds like you find editing rewarding, creatively. Segura: I love talking to talented people. I love seeing how they work. I have a really good team at Archie that have their expertise. For me, the fun is talking to talent and going back and forth and seeing what they produce and being in the trenches with them. Editorially, my instinct is not to micromanage, but to find people who fit the assignment and watch them succeed. Nick has a great resume and once we got through that first script, I stepped back and let him do what he’s good at. Same with Kelly Thompson on Sabrina. Her take was so good that once the shakedown cruise is over, you let them go and be good at what they do. As a writer, I hate to be micromanaged. I hate for someone to be changing what I do, so I take that into account when managing talent. If you’re going to give notes, you want to explain why. Transparency is really important. That’s my philosophy in a nutshell — let talented people do talented things. Great interview! I love his insight on steering timeless characters through an evolving medium. Certain characters definitely thrive on the cyclical nature of comic storytelling. Batman and the Riverdale crew work best in this bubble where you can pick up any issue and get a good story. Stretch out the story too long or stray too much from the main characterizations, and fans will become disinterested. Boy oh boy, I can’t wait for the guy who made Captain America a fascist to help his new editor continue hetconning the only aromantic asexual character in comics, just like that unwatchable show. Segura should stick to novels instead of “modernizing” other people’s stuff by sucking all the charm & uniqueness out of it and hiring Big 2 good ol boys to somehow reach a “wider” audience.